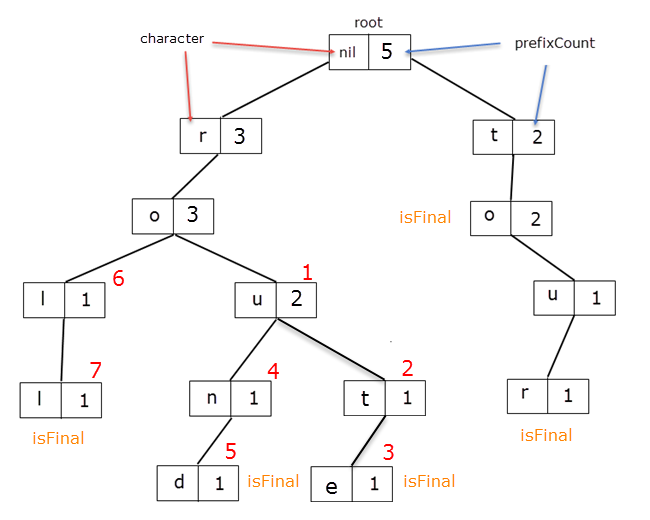 A Trie is a tree like data structure used for storing words in a way which facilitates fast look-ups. They prove very useful for handling dictionaries. 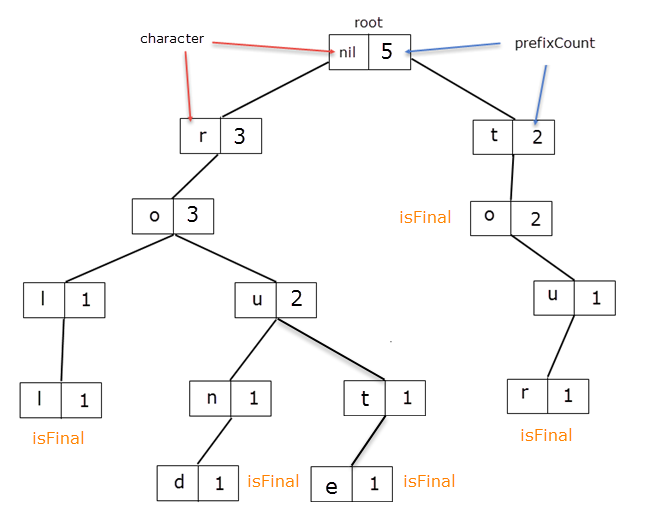 In Part 1 we defined the trie data structure and started outlining the code for it. In this articles we are going to take a look at the basic operation we can do on a trie: Insert, Query and Remove, in Part 2 we took a look at how we would implement basic operations on a trie and in Part 3 we started to take a deeper look at the tricks a trie could do. In this part we are going to see how to use a trie to get keep a sorted list of words and how we would go about generalizing the structure so that it will work with any kind of alphabet not just the letters from a to z. Returns the k-th word in our dictionary (k>=0 && k < uniqueWords). Bellow is a recursive implementation which should be called with one parameter:atIndex(the k value previously mentioned). We iterate through its children. If a child’s prefixCount is less or equal than our index value, we add it to skipped, which indicates how many words we are skipping with that child. When we get to a node and skipped + child.prefixCount > index it means that our kth word is within that child’s reach and we call the function recursively with that child and index = index - skipped. The index is adjusted so that we refer to the sequences starting form that child. Our goal is to find a node with index == 0 && node.isFinal. So far, we’ve assumed that all our input data was valid. We’ve assumed that all Strings given as parameters for querry,insert, etc. contained lowercase english characters, but what if they didn’t ? We used so far the lowercase english alphabet for our Trie. It’s time to generalize the Alphabet. The AlphabetCharacter needs to be Comparable for the kthWord function and Hashable because it will be used as a key in a dictionary. The reasons for making the SequenceCharacter conform to Comparable and Hashable are the same as for the alphabet. The syntax where U.SequenceCharacter == character is a generic type check, which makes sure that SequenceCharacter == AlphabetCharacter. The need of the constructor is caused by the following non-generic syntax of the kthWord function: return String(characters). let word: String = myTrie.kthWord(atIndex: 2)! How about having a Trie for Integers. Instead of a String, we will have Int and the alphabet will consist of all digits from 0…9. How hard can that be to implement ? 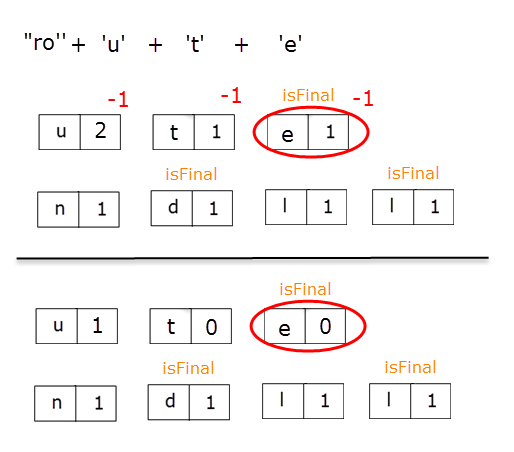 The constructor takes an array of Int8 and makes an Int out of it, while the toSequence()does the opposite by using a clerver mapping: the Int is converted to an String then each Character is mapped to an Int8. When you are typing something and a list of words appear, it’s our Trie in play! The function will take a CharacterSequence as prefix and will return [CharacterSequence] containing the suggested words. If given “prefix” is not contained in the Trie, we will return an empty list. Otherwise, using a DFS, we get all nodes accessible from the prefix. We need them as tuples of the following form (node, corresponding character, prefixCount). PrefixCount will dictate how to compute words. Bellow is a standard DFS. In the buildWords function we iterate discoveredNodes until we find a node for which isFinal is set to true. When such node is found, we iterate once again from the beginning, but stopping at our initial node. 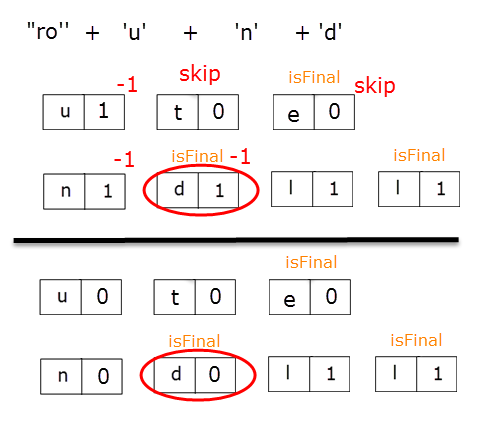 Each node found along the way, having counter > 0, is included in the current word and counter is decremented, in order to indicate the limited number of usages. // otherwise, the node was used in other sequences and is now "used up"
I left 2 prints there to make clear at runtime how the algorithm works. Now, that we reached the ending, I hope the article made you see the importance and usefulness of the Trie data structure .